With just a couple of feet away from the crystal blue sea, a stunning location of Villa Arca Adriatica attracts travelers and families from all around the Europe. Our guests enjoy spectacular view on natural beauty of Kvarner islands, a peaceful peninsular setting, above pebble and rock beach. You will be placed in generously sized apartment Gajeta**** that is luxury designed and has a spacious interior with large terrace and balcony in every room, which maximize the splendor of the surroundings. Waking up with the sounds of seagulls, intoxicating Mediterranean and Adriatic fragrances, or enjoying pictures sun sets. Apartment Gajeta**** in Villa Arca Adriatica is a perfect getaway, and a base from which you can surrender yourself to a complete Mediterranean experience. 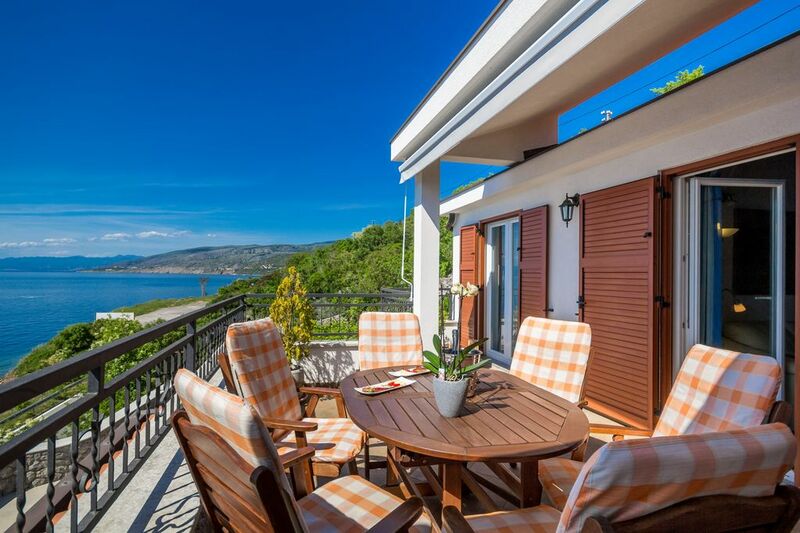 The Villa is located in park of nature North Velebit and build according to very strict ecological criteria. There is a large barbeque area in front of Villa, parking place, free of charge, as well. Apartment GAJETA**** (67m 2), with spacious sea view terrace ( additional 25m2) and sea view balcony for its two rooms - blue, gray and silver color, oak wood, modern design, glass & stainless steel. A big living room in the apartment seats 6 people, on two sofas, and has a large terrace with an amazing sea and islands view. Refrigerator has an ice chamber also. Kitchen is fully equipped, and has a full set of glasses, cups, and dinnerware. It has a coffee machine, a dishwasher and an electric ceramic stove. Child Highchair can be provided if necessery. Garden with Mediterranean plants and fruits is located in front of the apartment. A large terrace with spectacular ocean and island view. Some times you can see the dolphins in front of the Villa. Supermooie woning met een geweldig uitzicht! Het appartement is volledig in orde, zowel qua grootte (ruim appartement met groot terras), qua comfort (airco, wasmachine, vaatwasser, handdoeken en lakens aanwezig), qua ligging (baan oversteken en je zit in de zee tussen de rosten, mogelijkheden om verschillende stranden te bezoeken, Plitvice, eiland Rab, Zavartnicabaai,....). Ook supervriendelijke en gastvrije eigenaars die je advies en tips geven. Many attractive scuba diving locations around. Also do not miss the opportunity to try out fresh sea food specials! We recommend you take a half on hour boat trip to the Island of Prvic, an Park of Nature with amazing beaches and a home of protected bird griffon volture. Also, we highly recommend you visit nearby inlet Zavratnica, which is probably one of the most beautiful coves of the Croatian Adriatic. Regarded as one of the major tourist attractions of the northern coastal area because of its beauty, Zavratnica was designated a protected landscape in 1964. Sveti Juraj is situated 10 km south of historic city of Senj, famous for its turbulent and amazing medieval history, that has left behind one of Croatian symbols - the "Nehaj" fortress. Nehaj is now a museum where you can see and learn all about sea battles, weapons, clothing, and medieval customs. Also, many entertainment events take place in Senj, where we can point out Summer Carnival. You can also choose from great bars and night clubs in the city. If you wish to explore green parts of Croatia, after enjoying the blue parts, no problem! Just above Sveti Juraj you can find Kuterevo, a small village where a shelter for wild bears is located. For those of you who like biking, you will have memorable times exploring all of the bike trails in the area and experiencing beautiful surroundings. For great hiking and mountain climbing you should visit Velebit, the largest and longest Croatian mountain. From its top Zavizan you will reward yourself with the most liberating, divine view of Croatian islands you can imagine. On specially clear day, you can see the contours of Italian coast. Paklenica, part of Velebit, has been proclaimed a national park. Of course, when in Sveti Juraj, you have a chance to visit UNESCO nature heritage Plitvice lakes witch outstanding virgin beauty become famous worldwide. And as a memory for you and a present for your family and friends from Sveti Juraj, we recommend gold medal winner honey, so you can have sent and tastes of true Mediterranean even miles away. Up to 3 days stay is considered as 'short stay'. In that case rate per night is higher for 20% than regular seasonal rate. Rate is PER APARTMENT - PER NIGHT based on 4 person or less. (Maximum 6 persons). One child under 2 years of age goes free , with no claim to his/her own bed. We can arrange extra kids bed as well. The sojourn tax is included in the price. WE CAN OFFER ADDITIONAL APARTMENT, SAME CATEGORY.